A watershed is an area where water - the necessity of life second only to air - falls, filters and collects. Water falls from clouds in the sky as snow, rain, hail and sleet. These forms of precipitation drain to the lowest available point or are absorbed and filtered into underground aquifers. An aquifer is an underground river, stream or pool that serves as deep freshwater reservoirs for the planet. Falling precipitation collects everything it encounters. It collects dirt, chemicals and pollutants and carries them to the lowest point of the watershed. The water is either absorbed, or filtered into the underground aquifer, or continues to carry the pollutants to lower rivers, lakes and eventually seas and oceans. The dirt, chemicals and pollutants change the quality of water in clear running streams, in city water supplies, and in our lakes and oceans. The earth is divided into major and minor land and ocean watersheds. These areas of drainage are full of life and activity. Animals, insects, plants and reptiles busily live in watersheds. People and cities, too, inhabit watershed areas. Activity 1 – Who discovered watersheds? John Wesley Powell was the first western explorer to navigate the Grand Canyon. Powell was a Civil War veteran who had lost his arm; strapped to his boat, Emma Jean, he floated down the Colorado River through the Grand Canyon in 1869 and again in 1871. He decided after seeing the surrounding arid (dry) lands that a watershed should define where people should live. He understood watersheds to be the basis of natural environmental communities. Open Google Earth. Look up the Colorado River. Research John Wesley Powell and his boat Emma Jean. Find out what he learned from the surrounding Pueblo communities. Chart his course. Find the lake that is named after him. Write and illustrate a paper about Mr. Powell’s idea about watersheds and how they effect and are affected by development..
Each watershed is separated from adjacent watersheds by a divide, often in the form of a ridge, hill, or mountain. That line or divide splits the precipitation into two opposite directions. Print a map of the United States. Locate the major bodies of water- lakes and oceans. Draw the two divides and label them. 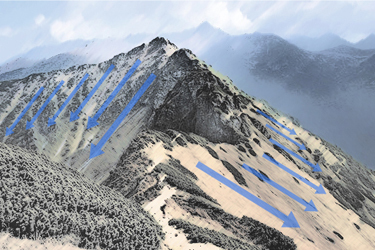 Ridges of high terrains divide continents into watershed regions. Streams, rivers, aquifers and lakes store and filter and move water to the oceans. Build a model of a watershed showing hgh points, streams, rivers, ponds and lakes. Go to Surf Your Watershed and find your watershed. 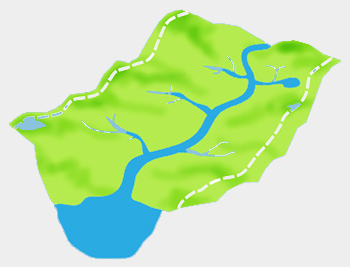 Draw a map of your watershed and record the streams, rivers and lakes that carry water. Mark the high and low points. Make notes about the pollutants and run off that are washed into the water. Look at Beyond Mannahatta: The Welikia Project. 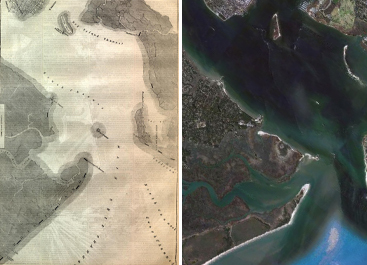 This is a study of what Manhattan looked like before it was developed. It is also speculation about the plants, animals, flora and fauna that called Manhattan home before people arrived. Now look at your city. Can you find historical pictures of when your city was first settled? 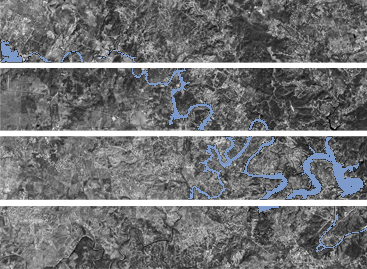 Can you see what your river and or lakes looked like before the city grew? Research the quality of water in your city and see what is causing it to be polluted. 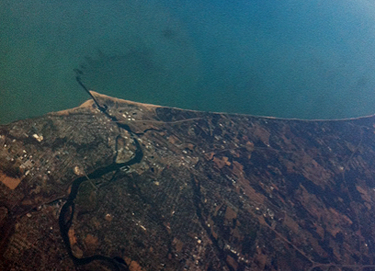 What do you think a city needs to help clean its water? What happens in your yard and your neighborhood’s yard and in the streets and parking lots of your city affect your local watershed. What affects your local watershed affects the global water system. Now that you know about watersheds, what can you do to watch over your watershed. Research the activities and find resources to manage watershed regions. What actions can you take? Can you raise awareness about the importance of watersheds in your own neighborhood? 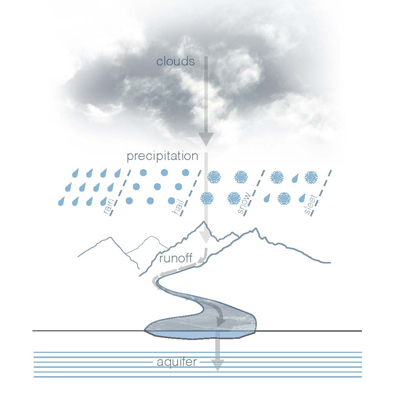 Watersheds move precipitation that is not absorbed or filtered to the ocean. Rivers are an important part of a watershed region. Watersheds are divided by high ridges of land. Keeping our streams and rivers clean is important to our drinking water. Does Water Usage Really Matter? YES! Here's Why!